You can't quite smell the sweat and resin in the spanking-new wrestling practice room, which is especially erected as one of the hobbies of the super-rich John du Pont (Steve Carell). Like a child's train set, it is meant to amuse him, but also satisfies his ideological urge to push U.S. athletics to the top of the world (especially against the Soviet team). And so he taps Olympic gold medalist Mark Schultz (Channing Tatum), training for the Worlds, to train under his tutelage at his majestic Pennsylvania estate. But Mark has difficult hurdles to overcome, including coming out of the shadow of his older brother, Dave (Mark Ruffalo), also an Olympic gold medalist, who's protected his younger brother since growing up virtual orphans. Dave turns down a request to join Mark (du Pont's reaction to the news that Dave "can't be bought" is priceless), leaving the younger man to train with only the amateur guidance of one of the richest (and possibly most egotistical) men in America. Directed by Bennett Miller ("Capote," "Moneyball"), "Foxcatcher" is based on an incredible true-crime story instigated by the heir to a family fortune, and tells how satisfying his elusive dreams brings tragedy to others. The film is in equal parts about personal bests, a search for a father figure, patriotism, hubris and jealousy, all joined in the tale of an athlete looking for a purpose in a country that may not consider wrestling a real career (unless it's performed in a Thunderdome with much spilling of blood). It is also quite funny, until it isn't, and that's due to the humanity, ambition and nuance that each of the lead actors brings to their roles in the triangle. Working under prosthetic makeup that changes his appearance into one of the creepiest-looking millionaires ever, Carell exudes du Pont's deeply-rooted desire to be accepted and praised, as well as his unshakeable self-aggrandizement (his preferred moniker is "Golden Eagle"). Tatum plays Mark as a lunk who is woefully vulnerable, despite his size and athletic prowess. Off the wrestling mat he is a lost lamb, conveying an almost child-like admiration of du Pont that is sadly off the mark. Ruffalo brings a great deal of wisdom and self-interest to his character, a family man who tries to be a protector of his brother, but who finds himself being pushed away for all the wrong reasons. 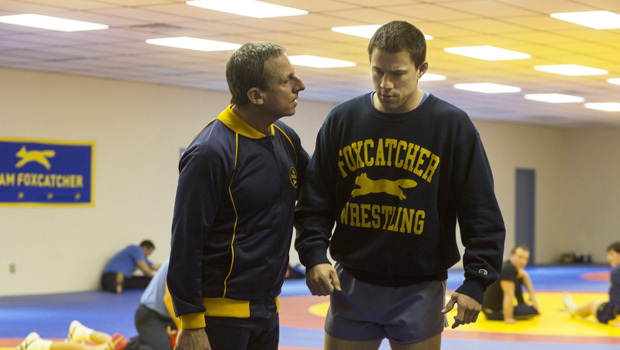 Released by Sony Pictures Classics, "Foxcatcher" will open on November 14. It is Rated R for "some drug use" and a scene of violence. Running time: 2:14. To watch a trailer for "Foxcatcher" click on the video player below. An incendiary Northern Ireland in "'71"